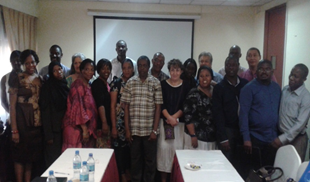 In collaboration with the US Centers for Disease Control and Prevention (CDC) and the Ministry of Health of Tanzania, a regional SLIPTA auditor training was conducted on 22-26 September 2014 in Dar es Salaam, Tanzania. Facilitated by two senior programme specialists from ASLM, a total of 25 participants successfully completed the training to become auditors of the World Health Organization Regional Office for Africa (WHO-AFRO) Stepwise Laboratory Quality Improvement Process Towards Accreditation (SLIPTA) checklist. The 25 participants came from a variety of institutions, such as the Foundation for Innovative New Diagnostics and Global Health Care Public Foundation, and countries including namely Angola, Cameroon, Namibia, Swaziland, and Tanzania, among others. Additionally, on 8-10 October, ASLM and the Clinical and Laboratory Standards Institute (CLSI) conducted a Quality Management System (QMS) workshop for Laboratory Leadership in Namibia. The objectives of the training were to sensitise managers on QMS, and provide them with the tools to implement QMS programmes such as the ISO1589 standard, Strengthening Laboratory Management Toward Accreditation (SLMTA) and SLIPTA. Twenty-five participants from the Ministry of Health and Social Services (MOHSS) Namibia, CDC and laboratory and quality managers from laboratories and universities in Namibia, participated in the training. Such training activities, which have resulted, cumulatively, in the training of over 150 laboratory auditors, form a cornerstone of ASLM activities for advancing laboratory medicine through transforming the quality of testing. As more laboratories undergo official SLIPTA audits, laboratory staff are able to systematically track improvements, ultimately leading to better laboratory services for their clients.